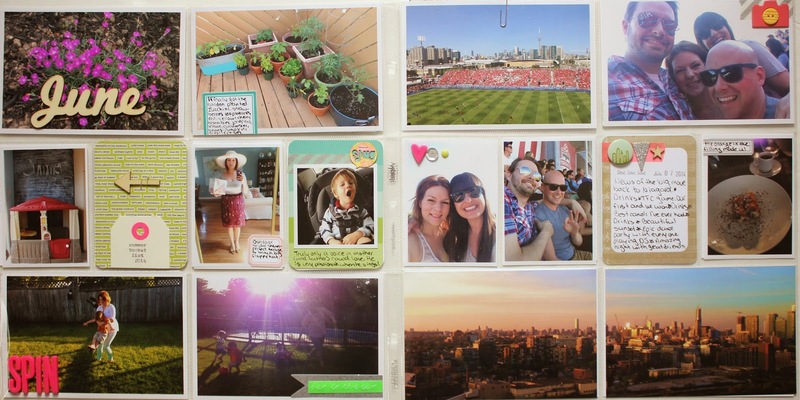 I made this spread sometime in the summer and just got around to photographing it last week. I couldn't believe jut how "summer" it felt when I pulled it out of the album. Almost all of the photos are taken outside and the colours are light and bright. 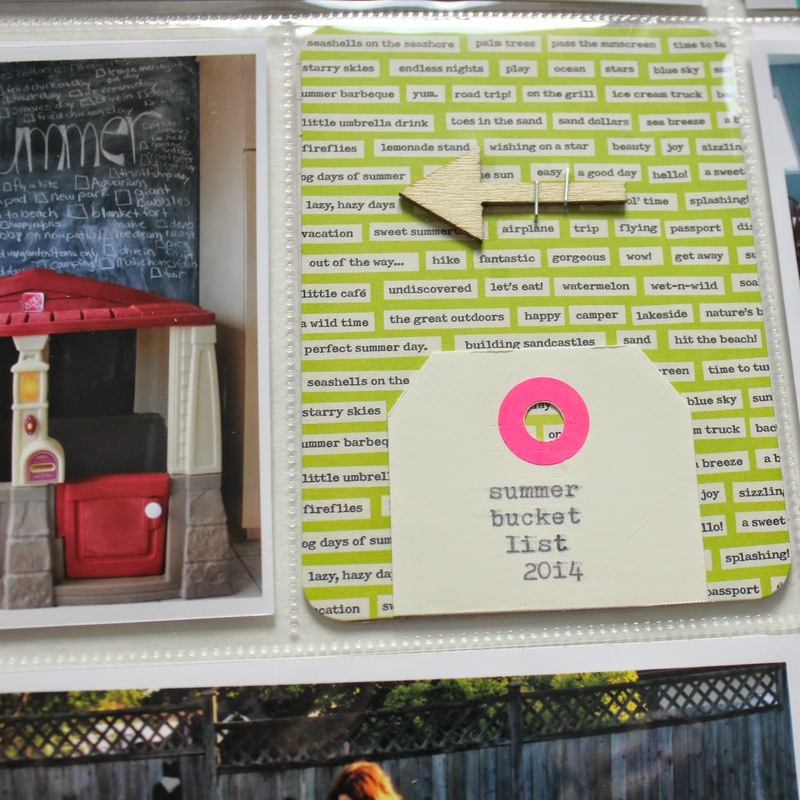 I think this spread really encompasses whta summer is all about. 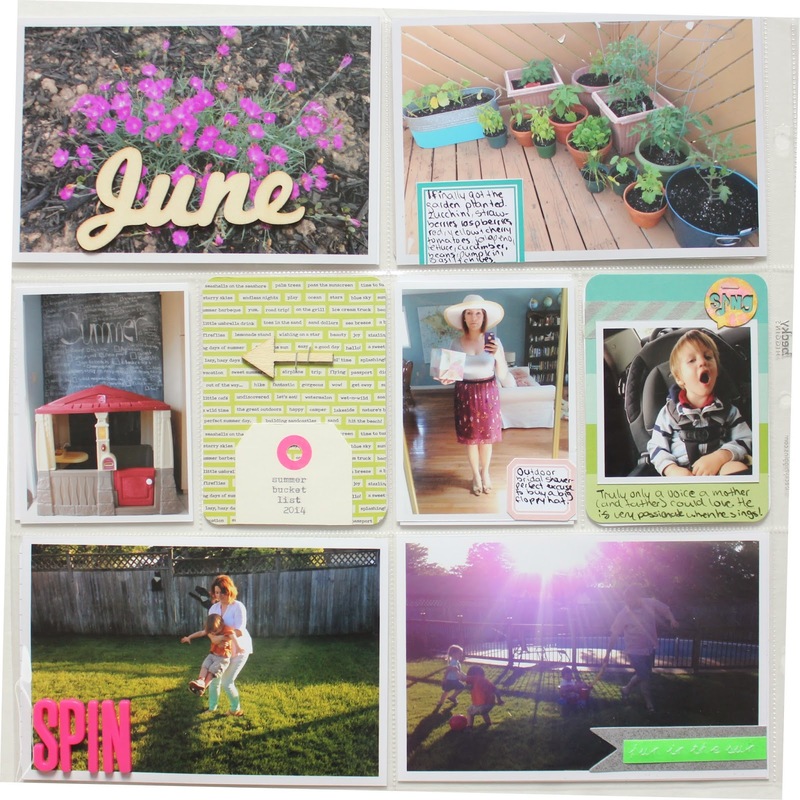 I loved that wood veneer "june" that came in the (surprise, surprise) June Studio Calico Project Life kit. I usually do my monthly pockets in a 3x4 spot, however the veneer was a little to big, so I taped it on top of a photo of my phlox. 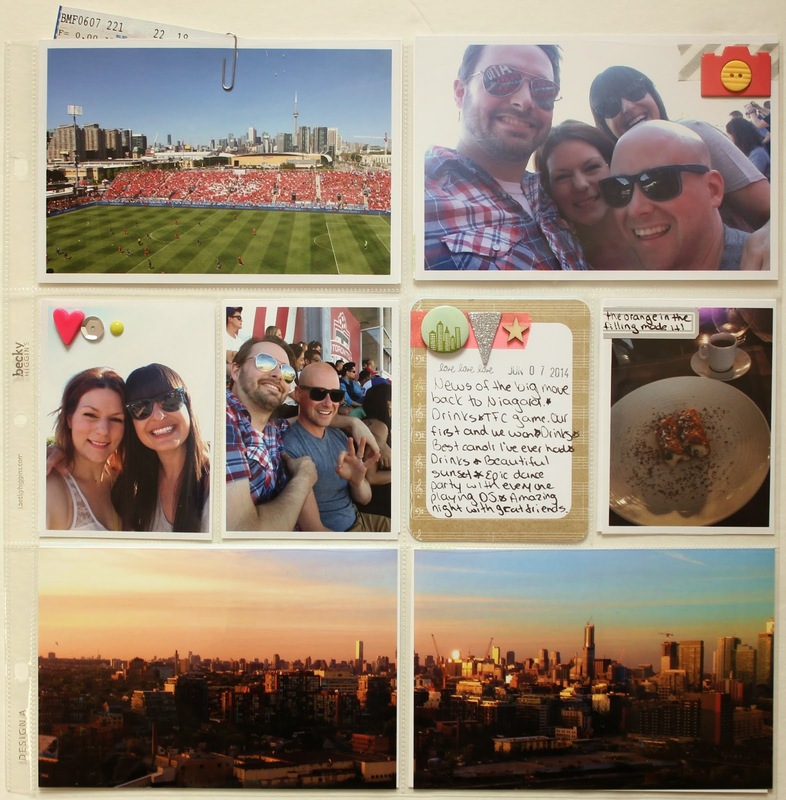 We went to go visit friends in Toronto and the skyline from their balconey at sunset was just stunning. I took so many photos and cropped this one at 4x12. I then cropped that 4x12 photo in Photoshop into 2 4x6 photos. I get my photos printed at Costco, and by doing this, I only have to pay for two 4x6 photos ($0.34 total) as opposed to printing a 12x12, which is $4.99 I believe. One of my favourite parts. I added a neon pink reinforcer to the hole on this white tag and did some typing on it and yes that is an 'i' instead of a 1. My typewriter doesn't have a 1 and I haven't learned how to do capital lettters on my typewriter yet. 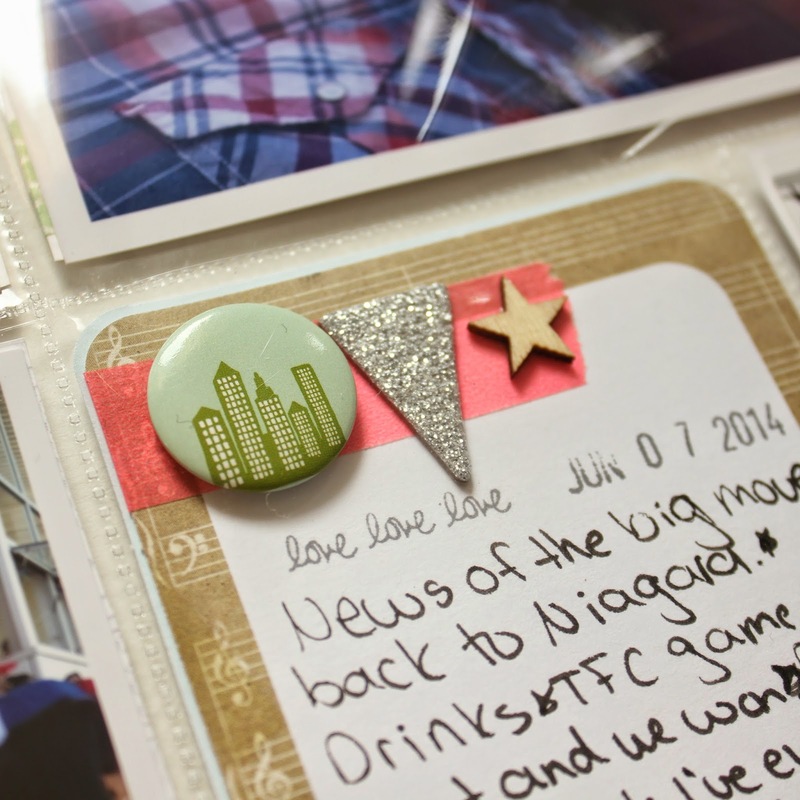 That skyline badge was just perfect for journaling about our night in the "big city". 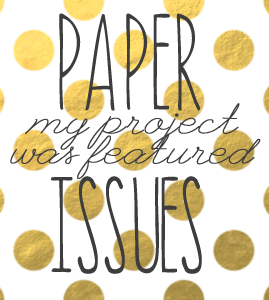 I lined it up with some other little bits on some neon washi tape. It seems very strange to be talking about a spread from before summer even offically started when we are right in the heart of fall, with more leaves on the ground than trees currently and downright cold mornings. With winter right around the corner, I know I'm going to be looking at this summery spread over and over, wishing we were back in warmer days.